Proof The Entrepreneurial Spirit Is Alive! The “Hers” holster doesn’t need a belt to stay in place and can be carried anywhere on the waist, from strong-side to cross-draw and every place in-between. That’s a custom Novak Colt 1903. Holster’s about $49.95. I’ve had the pleasure to watch this little company grow from a “Gee, we have an idea” stage to a company doing splendid work supplying honestly innovative products to people like you and me. The two Nate’s, Nate Beard and Nate Johnson and their wives started N82 — Nate Squared … get it? — in 2009. 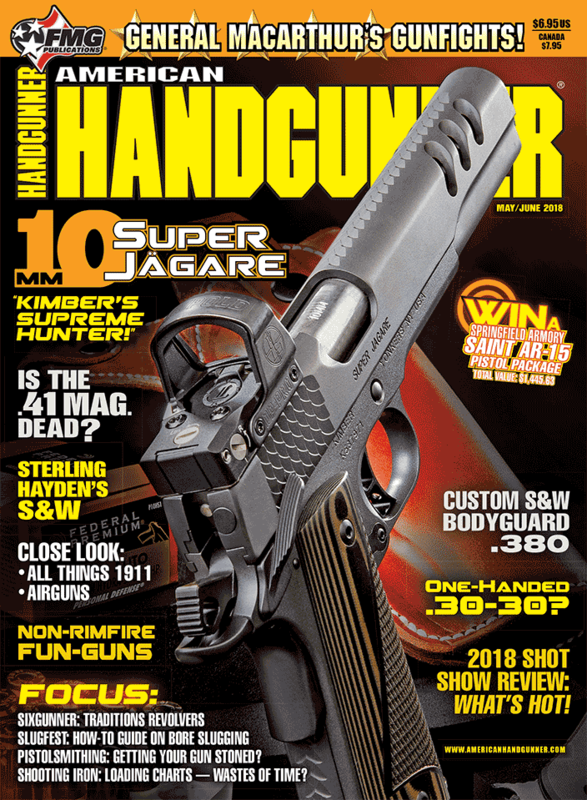 Like many of us they were frustrated by the state of holster design and were wondering out loud to each other what it would take for a “perfect” holster. They said it should isolate the gun from your body, the materials needed to be pliable and a moisture barrier would make it all the better. They jokingly said they should just make their own. Oops, that did it — because that’s exactly what happened. Learning to sew, making the experimental first-models, learning about business from the ground-up and continuing to improve their designs have led them to today’s successful company and strong, loyal following. But what’s the deal with their “funny” looking holsters? They don’t look like the sort of holster we’re used to seeing. Why do they work and what’s the big secret anyway? Right off the bat, the only real secrets stem from plain hard work. Taking their ideas, they’ve created top quality, carefully constructed gear meeting real world needs for people who carry guns every single day. Build it right, make it with quality materials and stand behind it translates into the “big secret” behind their successes. My dad used to tell me, “It’s funny how the harder you work, the luckier you get.” Here’s proof. Their holsters come with a lifetime warranty, and if you don’t like the one you bought return it within 30 days in original condition and you get your money back. And in today’s long waiting periods, most orders ship within five days of being received. More of that hard work thing. The Pro Tandem also has the Twist Release Retention System, one hand holstering, firearm-specific polycarbonate holster shell, adjustable cant and much more. About $72.95. There’s one little secret — which isn’t really a secret, though. Their hard shell holsters have what they call a “Twist Release” system. It only works when the holster is worn so if you try to take the gun out of the rig when it’s off your body, be careful. When worn, a simple slight twist of the wrist clears the gun’s trigger guard from the holster form, allowing a smooth, fast draw. Without that little twist, the gun stays put. It’s a sort of “passive” retention engaging automatically when you holster. Smart. Their Original, Original Compact and similar models are simple and very good at what they’re designed for. The “holster” part is a dense herringbone elastic forming to the gun. They’re not gun-specific but size-specific, so small frame autos fit into the same holster. They’re similar to the new “Hers” holster (shown), which is engineered specifically for a woman. It doesn’t require a gun belt and can be used in any carry position, including cross draw. I found my Novak-customized 1903 Colt fit neatly into the “Hers” Micro Compact size. I’m thinking Kimber Solo, small Kahr, etc. would fit too. They have a great fit chart on their website. The backing is the foundation of their designs. There’s no hard materials and no hardware exposed to your body. There’s pliable facing leather (holster side), neoprene in the center as a moisture and comfort barrier, with suede on the back so your skin can breathe and to keep the holster in place. The Professional is a Nate Squared classic. An adjustable cant, LockDown Clip and their ultra-comfortable design are just some of the features. About $69.95. They have a good line-up of rigs, all based on their idea of what a holster should be. Their new Envoy series has a single clip making it easy to put on and take off if that’s something you do a lot. Their Tactical Bag Holster is adaptable for today’s generations of EDC-type bags and purses. Hook and Loop on the back of the “pad” allows it to stay securely in place. Look for other rigs (some with a “tuckable” carry method), mag carriers and even a nifty Magna-Arm magnet gun mount. I didn’t delve too deeply into product specifics because I thought it was better to use the space to tell about the people and the ideas behind what Nate Squared does. Reach out to them and I promise you won’t go wrong.